I was not a huge fan of "Monsters Versus Aliens". It was decent enough entertainment, but certainly not a must-see film. After all, there have been quite a few 3-D CGI films and this one was no better or worse than most of them. Watchable, certainly, but that's about all. Well, my opinion of "B.O.B. 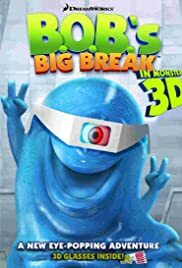 's Big Break" (a special feature on the DVD for "Monsters Versus Aliens") is pretty much the same--it's entertaining but certainly nothing exceptional. This short is a prequel to the full-length film, as Susan is nowhere to be seen. Instead, Dr. Cockroach, the Missing Link and B.O.B. star in the film--with some support by the General. Fortunately, all are voiced by the original character actors. The story involves Doc Cockroach and the Missing Link trying to use B.O.B. in order to escape their captivity in a government complex. As for B.O.B., he's oblivious as to what is happening and believes he's having a birthday party--while Doc Cockroach is actually trying to turn him into a giant bomb. Where this goes is nice fun and naturally the General has something to say about all this. The film has nice CG animation and decent characters and story, but nothing ever makes this THAT interesting. If you saw the movie and not this short, I wouldn't say you need to hurry to get around to seeing it.